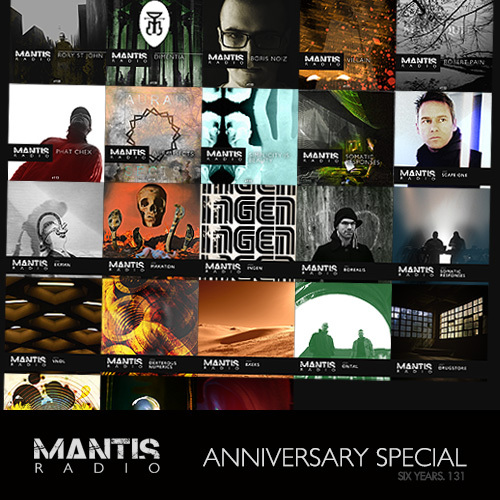 As we enter our 7th year of broadcasting Mantis Radio I take a retrospective look over the past year, re-playing some of my favourite tracks. Bearing in mind I played some 473 tracks across 23 shows, I’ve some task in getting that down to an hours worth. I’ll also be playing a 20 minute edit from our 3 most popular showcase sessions over the past year, as is the tradition with these anniversary shows. Over the weekend I looked at all the stats, taking into account downloads from the podcast, Mixcloud listens, url hits and archive visits to determine the most popular shows from the last 12 months. For those of you interested we had close to 300k hits on those shows and our most popular show turned in nearly 45k hits. Which is huge. I’m stunned and so proud the show has reached such a big audience. A huge thank you to all the showcased guests and labels – Rory St John, Dimentia, Boris Noiz, Villain, Robert Pain, Phat Chex, Aural Sects, Simplicity is Beauty, Somatic Responses (ambient), Scape One, Ekman, Makaton, Ingen, Borealis, Somatic Responses (hard), VNDL, Dexterous Numerics, Baeks, Ontal, Drugstore, Kawatin, Dead TV Society and most recently Nonima. Of course thanks have to go out to all the artists and labels whose tracks I have mangled, mixed, and played on the show. A complete list of all 473 is here. Finally, you guys, the listeners. Much love to you all for sticking with us these past six years.